I have had several opportunities to find and fix various security issues within Ruby on Rails applications over time. Based on my own experience I would like to help you with making Rails apps more secure. At the same time, I hope that you won’t find any of the below issues in any of your apps. If you want to have a better understanding of built-in Ruby on Rails security mechanism you can take a look at the official Securing Rails Applications guide. Well, even though an infinite session duration seems to be a right approach from user experience perspective (because user stays signed in forever, so she doesn’t have to sign in every time she visits your application) it’s a bad idea. To prevent situations when somebody hijacks user’s session because she forgot to sign out using a computer in a public library, the session should expire as soon a possible. would set the session cookie to expire automatically 12 hours after creation. This solution is straightforward to be implemented, however, has a major drawback. It sets an expiration timestamp in a user’s browser. Anybody who would gain an access to the session cookie can easily extend the timestamp by modifying the cookie. One possibility is to set the expiry time-stamp of the cookie with the session ID. However the client can edit cookies that are stored in the web browser so expiring sessions on the server is safe. # The time you want to timeout the user session without activity. # After this time the user will be asked for credentials again. # Default is 30 minutes. If you don’t use the gem you can create a Session model which would store a user session together with created_at & updated_at timestamps and take care of removing outdated records. Again, you can find an example in the official guide. UPDATE 09.10.18: Thanks to InCaseOfEmergency’s comment I learned that Rails 5.2 improved the built-in solution and the expiration timestamp is a part of the session cookie. Awesome! How many times a single user can try to sign in into your application before being banned? If your answer is infinitely, that means that you have a security hole. If a user can try many e-mail and password combinations without any consequence, it also means that an attacker can. Preparing a script to make a dictionary or brute-force attack is a matter of minutes today. A brute-force attack is trying every possible combination. A dictionary attack is a guessing attack based on a precompiled list of options like most commonly used passwords. To fix the issue user should be blocked after providing an incorrect combination of login and password X number of times. If you use devise gem the solution is as simple as the previous one. There is Lockable module which allows blocking a user access after a certain number of attempts. A number of allowed attempts is up to you, but five seems to be a good starting point. You can always tweak the value if you start to receive valid complaints from users. :time which unblocks a user automatically after some configured time. :email which sends an email to a user when the lock happens, containing a link to unlock an account. Each of them is much better than none, but again the final decision is up to you. devise also make it possible to use both of them at the same time. You can find more details in the official documentation. If you don’t use the gem you can implement a similar solution by yourself (the code is open 🙂 ) or check if a library you use offers a similar solution. 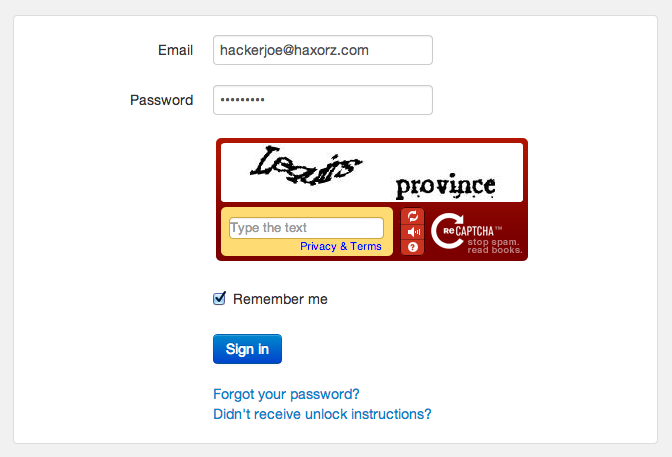 Implementing CAPTCHA also helps in preventing brute-force and dictionary attacks. Not so obvious, but a serious problem. 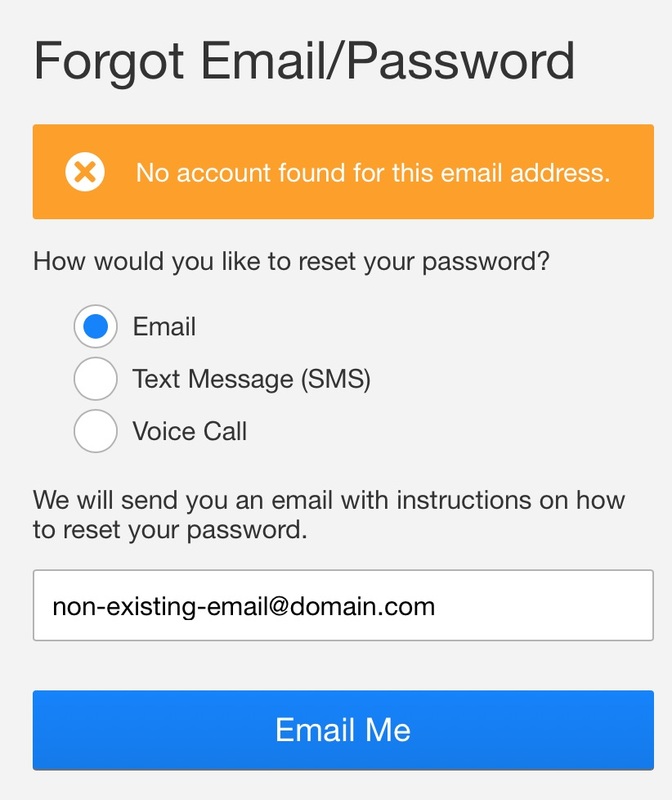 Please visit your application and go to no-so-often-visited Reset your password page. What would happen if you provided an e-mail address which is not associated with any user of the application? I hope that’s not a validation error with User with the provided email address does not exist message. Why? For a potential attacker, it provides an easy way to collect email addresses which exist in the system. It’s an easy-peasy job to prepare or find a ready-to-use script for making millions of request with existing email addresses and based on your application responses determine which one of them exist. Having such a list an attacker can use a security hole described in the previous point and without a lockout mechanism, she can gain access to user accounts. An application should respond the same (either it is a JSON response from API or a redirection to a page with some confirmation message) when a user provides email address assigned to one of the application users or a random one. 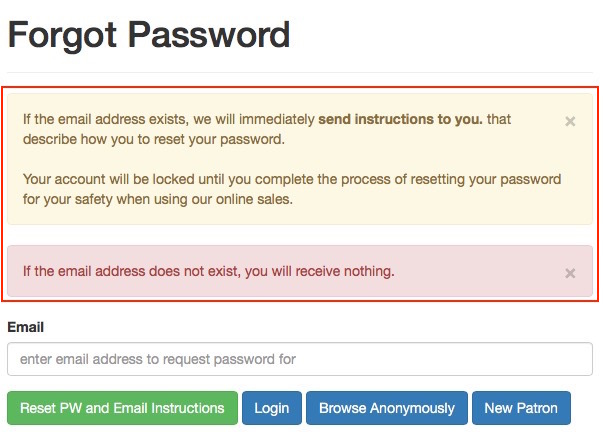 As a result, an attacker won’t be able to collect email addresses of your users. It will change confirmation, password recovery and other workflows to behave the same regardless if the e-mail provided was right or wrong. If you don’t use devise you should adjust your application to behave the same regardless if a user provides her email address or some other. Thanks to the above response a potential attacker knows that [email protected] e-mail address is not associated with any user. She can try with a next address. A very clear message (actually two, one under another) which does not divulge any email address. You tested it making some cURL requests using IDs of projects assigned to your test user and your application responded with expected JSON payload containing projects’ details. You deployed the endpoint to production finally. But wait! Have you checked what would happen if you made a request for a project assigned to another user? Boom! You forgot to limit access to only current_user’s projects. If you want to have control over resources in an object-oriented way you can choose either pundit or cancan gem. the gem will shout on you if you forget to call its authorize method (which limits access to resources basically) in any of controllers’ actions2. Thanks to that you can act even before pushing code to a repository. If you have played with neither pundit nor cancan yet I recommend giving them a shot. The vast majority of our applications’ users do not have access to tools like 1password or KeePass which allow us to generate secure passwords, store them securely and fill them out automatically during every sign in. An average user chooses passwords that are easy to remember and very often use the same password for every application. In my opinion it is our responsibility to educate users and take care of their security even if it may be a bit unpleasant for them. Please don’t allow users to create accounts in your application using passwords like 12345678 or qwerty. They make brute-force and dictionary attack way much easier. Introduce and apply a password policy. A password policy is a set of rules designed to enhance computer security by encouraging users to employ strong passwords and use them properly3. 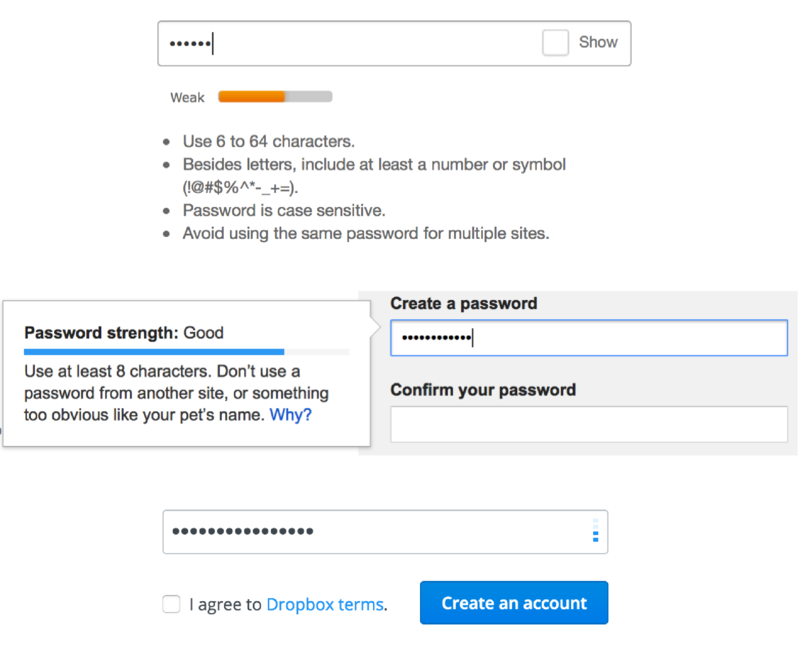 1 digit and 1 special character"
Password strength indicators from eBay, Gmail, and Dropbox. Informing users about a password policy in an easy-to-understand way is as important as the policy. There were, are and will be security issues in Ruby on Rails applications.